Engagement RingsBrowse our stunning collection of beautifully crafted diamond and gemstone engagement rings or visit us in store to discuss our custom design service. Under $5000At Diamonds and Pearls Jewellery, we cater for a full range of budgets and have created a collection of beautiful rings that can show your love without costing you the earth! Diamond JewelleryDiamond Jewellery | We have stunning engagement rings, glistening wedding bands, classic diamond studs or something with extra sparkle. All available in our Perth store. Come in and talk to our Jeweller today. Diamonds and Pearls jewellery has the perfect piece for any occasion. Dress RingsWhether it be for every day or for a special occasion, Diamonds and Pearls Jewellery have a stunning range of dress rings for you to browse. Our collection ranges from statement gemstone rings, black diamond designs, antique and art-deco inspired styles, impressive diamond bands and so much more. If you can’t find what you like in store, then we also encourage you to get creative with designs and explore our bespoke and custom made design service. EarringsDiamond Earrings | Explore our collection of diamond earrings from drop and chandelier styles, to classic studs, something simple for every day or a fancier piece to celebrate a special occasion. Necklaces & PendantsDiamond Necklaces & Pendants | From simple to dazzling, we have have the perfect diamond necklace or pendant to suit any occasion. Wedding BandsGetting married? At Diamonds and Pearls Jewellery we have a wide range of wedding rings that you will both fall in love with. Our collection ranges from classic styles to the more contemporary designs, and if you can’t find what you are looking for on the showroom floor, we can organise for a custom made or bespoke piece especially for you. Our men’s wedding ring collection comprises of styles from two reputable companies, Peter W Beck and Infinity Rings. Pick from 9K and 18K gold, Platinum and Titanium or even mix metals for something completely unique. Our women’s wedding ring collection boasts a variety of styles, from classic plain metal rings, to diamond and gemstone set pieces, in varying shapes and patterns. Browse our selection online or visit us in store to discuss your custom design needs. Infinity RingsThe Infinity Rings collection is inspired by both classic and modern designs that embody European craftsmanship through high quality materials and details. Infinity Rings epitomises European indulgence in quality and class. Choose from their four collections Debonair, Elements, Lustre, and Classic, all of which offer various customised metals and design combinations. Prices are determined based on metal choice, ring size, the addition of gemstones etc so if any style below catches your eye, please get in touch with us to organise a personalised quote. Peter W Beck RingsPeter W Beck’s wedding rings are 100% Australian made and their collection comprises of a huge range of traditional and contemporary designs for both men and women. Every wedding ring is manufactured using world leading technology combined with traditional craftsmanship, using the finest Precious Metals (Including Gold, Platinum and Titanium) controlled by stringent quality control techniques to ensure consistent quality and standards. Pearl JewelleryAt Diamonds and Pearls Jewellery, we carefully select only the best quality pearls to create our pearl jewellery. From Australian Broome pearls, the Tahitian black pearl and rich Golden pearls, we have a huge selection of fine jewellery pieces to choose from. Customer’s are also invited to hand pick a pearl from our loose collection and use our bespoke design service to add a personal touch to their special piece of jewellery. Autore PearlsBrowse our collection of Autore South Sea pearl jewellery. The Autore Group is one of the largest South Sea pearl companies in the world and are renowned for their directional and unique South Sea pearl jewellery designs. All Autore jewellery is accompanied by a certificate of authenticity and presented in a special Autore jewellery box. South Sea PearlsAt Diamonds and Pearls Jewellery, we carefully select only the best quality pearls to create our pearl jewellery. From Australian Broome pearls, the Tahitian black pearl and rich Golden pearls, we have a huge selection of fine jewellery pieces to choose from. Customer’s are also invited to hand pick a pearl from our loose collection and use our bespoke design service to add a personal touch to their special piece of jewellery. RingsGemstone rings | Engagement and dress rings created with precious and semi-precious gemstones. Aquamarine, Sapphire, Morganite, Emerald, Ruby, Garnet, Citrine, Topaz, Amethyst, Peridot and more! Men's JewelleryWhether it be for father’s day, a special birthday, or just because, Diamonds and Pearls has the perfect piece for any occasion. Browse our collection of men’s jewellery here or come in store to view our full range. AnniversaryTraditional gifts for the big milestone anniversary’s include Gold, Sapphire, Diamond, Ruby, Emerald and Pearl. Below are a few of our favorites. 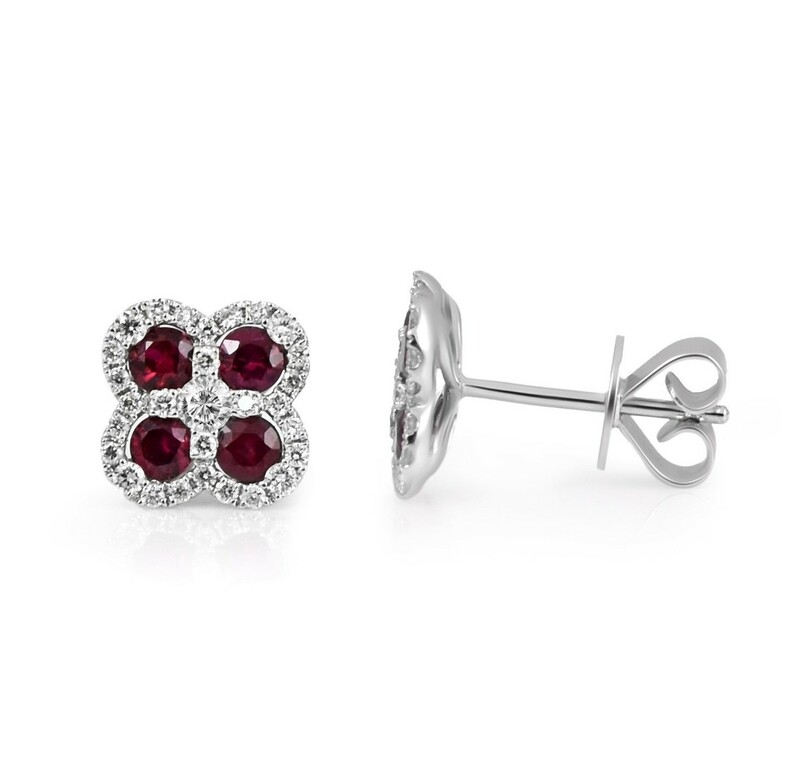 Visit our blog post here to discover which gemstone is for your year. 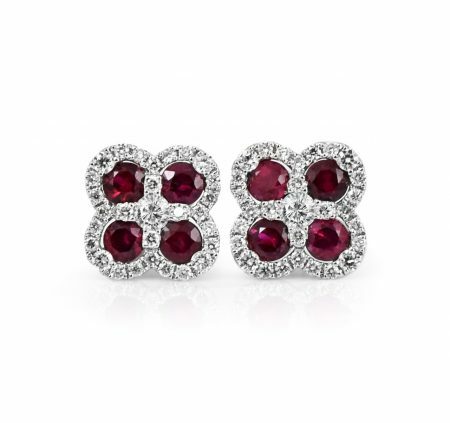 A pair of 18K white gold ruby and diamond earrings, featuring 8 rubies and 58 round brilliant cut diamonds in a claw setting. View our full coloured gemstone jewellery collection here.